shoutout from Mom, Mac Roundtable live video from Macworld online now, Chuck gives great customer service – follow him at twitter.com/ChuckSt8er, Phil tells us about online help for windows at Yahoo Answers and Mark Minasi tech forums. George from Tulsa tells us about the Brother HL5250 full duplex monochrome laser printer watch the video too. I load Windows 7 on the HP Mini-note using imgburn.com and on my Mac using VirtualBox from Sun at virtualbox.org. Get the Windows 7 Shortcuts for window management using an app from LifeHacker. Donald reviews Winclone from twocanoes.com/winclone and Jane explains how to copy a file path, read about it at galacticstrings.com. Our cable goes out as soon as Lost starts so I use ted from ted.nu to find it online and download via bittorrent. Connor creates a new Honda Bob commercial. On Chit Chat Across the Pond we cover the improved workaround for the Safari RSS problem http://brian.mastenbrook.net/display/27, we cover a Quicktime vulnerability in Windows and Mac http://support.apple.com/kb/HT3403, enjoy a Mac Trojan horse if you download an illegal copy of iWork ’09 blog.intego.com and ithreats.wordpress.com and finally Bart and I debate whether normal people need a Drobo. I love that new shortcut name – ‘sillacast! She loves hearing from you guys, so keep up the fun feedback. MacWorld Mac Roundtable Now on Video! Remember how thrilled I was that we got to do an episode of the Mac Roundtable live at Macworld? We posted the audio on the macroundtable website and of course it came through the podcast feed, but it turns out Chuck Joiner of more podcasts than I can count, has a new video podcast called Mac Voices at macvoices.tv and he brought a video guy with him to Macworld. The good part of this long drawn out story is Chuck let me embed the entire video of that show on podfeet.com! You can finally see what Katie Floyd and David Sparks look like, along with Victor Cajiao, Chuck Joiner himself, Adam Christianson and John Chambers, and even the effervescent Don McAllister! Head over to the site and see my amazing technicolor dreamcoat as you listen to Chuck make fun of it! Steve and I had to send in a broken Sony receiver to the place we bought it – complete with an extended service contract. The place was Circuit City. I was in line dealing with the service people 2 weeks ago and I tweeted (on Twitter) about the agony of customer service at Circuit City. Within an hour I had a tweet back from a guy who works for Circuit City. Over the next week and a half we debated about how to solve my problem. Imagine my dismay on Friday that Circuit City was liquidating and they still have my $600 receiver! i wrote to the guy I’d been talking to and explained that I was certain he had far worse problems on his hands (like losing his job) than my silly receiver but I was wondering if anything could be done. Well my new friend Chuck acknowledged the email on Friday night, and on Monday he sent me an email explaining what would happen (I will get it back) and telling me that was his last day at work. I started following him on Twitter today – and just now I got a tweet from him that said, “Allison: Chuck here. Thanks for the follow. Let me know how your receiver issue works out (closure for both of us). See you in Twittersphere”. How’s that for commitment to customers? You should follow Chuck too over at twitter.com/ChuckSt8er. By the way, we DID get the receiver back so Chuck was good to his word. Haven’t had the time to reconnect the 286 cables yet to find out if it’s fixed, but they did assure us that the extended warranty is still good because it was through General Electric. I love it Phil – one of my favorite things to do when we visit Steve’s relatives is to fix things on their computers. Maybe I’m not as social as I pretend, I’m much more comfortable in front of the computer than in those touchy feely situations! Thanks for the tip on those forums and on Yahoo Answers, as a neophyte Windows user I’m often too embarrassed to ask my dumb questions! Like, um, I still can’t figure out how to add a new printer! I moved to a new office and I’ve all the people around me and no one knows how to do it, they had someone do it for them! My solution has been to just not print anything. three weeks and I haven’t printed anything yet! George from Tulsa reporting on my new duplexing laser printer. Here’s the problem: there are times I must print and mail multiple copies of lengthy tax returns. Our heavy duty duplexing, collating, stapling copy machine died. Toward the end, it often jammed, misprinted, and even shredded originals. The mourning period was short indeed. Think Munchkins dancing around Oz singing, “Ding, dong, the Witch is dead!” But what to do about my tax returns? 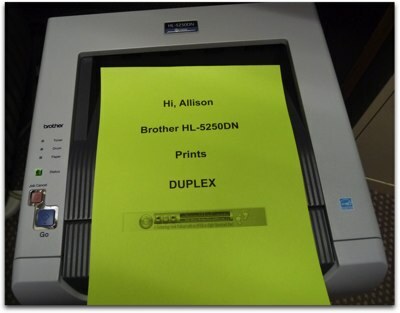 My solution was to buy a duplexing laser printer. Brief internet research showed the Brother HL-5250 DN to be my clear choice. On the shelf at Staples a couple of blocks away, it was $271, including tax, and the $70 rebate really did show up. 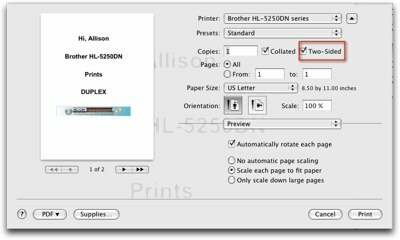 One heads up: the Brother Print dialog box is not the same in different Mac programs. The Duplex option can be hard to find. Last week’s Apple updates brought new Brother drivers. Perhaps that will help. Its always possible to print to PDF, then use Preview to print to paper. No trouble finding the duplex option there. The printer has many print options I’ve not tried. Its built-in ethernet will connect directly to a network. I’m just running it USB connected to my Mac, and we’re getting along ever so well. The Brother HL-5250DN. 100% of your printing on half the paper. George, I never tire of your reviews. You have that great Tulsa drawl and at the same time you get to the point quickly and succinctly – that’s a real trick! I can’t believe you can get a good quality monochrome laser printer for under $300 now. If I just printed (ever) I’d consider getting one myself instead of all these inkjets I have lying around! For all the listeners, take some lessons from George here. He sent in a beautiful audio recording. He sent in the full text of his review for our hearing impaired friends. He sent in 2 images for our sighted friends, and he even sent in a short VIDEO of the Brother HL5250 in action! It’s worth watching this 13 second video. thanks George! My friend Nancy is working on creating a website for a non-profit organization called Gangs Out of Downey. She’s learning how to use WordPress, and wanted some help understanding how to upload theme files to her WordPress installation on her server. What tool do you think I might have considered to do a tutorial for her? Well of COURSE I used ScreenSteps! I wrote up tons of explanation bits while I took screen snapshots, pointed with arrows where to click, drew boxes around things to highlight areas of interest and created url links right in the documentation. It was so easy to make a beautiful tutorial for her, I’m emailing her a PDF file she can print out and keep in her notebook for quick reference, and I also put it up in the sidebar on podfeet.com under the heading of Tutorials. I’ve been putting quite a few little tutorials up there, you should go check them out! And if you’d like to be able to create little or big tutorials and manuals for your friends and family or better yet for your business to make money and improve customer support, check out ScreenSteps over at screensteps.com. Make sure you use the coupon code NOSILLA for 25% off your purchase. You may have heard that Windows 7 came out in beta just a bit ago, and I jumped on the chance to try out this new version of Windows. You know I’m not a huge fan, but you also know how I love to try new things and I’d heard such great feedback already on it that it sounded like fun. You can only download it through Internet Explorer, so I downloaded it from my Vista laptop and picked up a license code. Now I didn’t want to booger up that production machine, so I threw Windows 7 on the HP Mini-note to see how it performed on a seriously underpowered netbook. The Mininote has a 1.2GHz VIA C7-M ULV (ultra-low voltage) processor – who’s ever even heard of that one? Well anywho, the download is an ISO image, so before I could load W7 on the Mininote I had to burn the image. Remember I mentioned last week that windows doesn’t come with a built in ISO image burning application, so I trolled my geek windows friends and my buddy Keith suggested ImgBurn from imgburn.com. Imgburn is freeware but they’ve got a nice PayPal button on their site so if you do download the software, and find it useful, give ’em a few bucks. I was VERY impressed with the simplicity of ImgBurn. I put a couple of screenshots in the shownotes so you could see how beautiful this app is. You have six entire options to choose from, like Write image file to disk (which is what I needed, Write files/folders to disk, create image file from disk, Create image file from files/folders, and then verify disk and discovery. That would be simple enough but they have pictures so you can tell what each one means without even reading! Hey, quit making fun of me, this was really a nice feature. They even had a line from a song at the bottom of the window “It’s the eye of the tiger, it’s the cream of the fight”. Isn’t that a nice touch? The second image I put in the shownotes shows you all the great info the give you AFTER the fact. The real test of ImgBurn was whether it actually did correctly put the ISO image on the disk, and so I borrowed a DVD drive from my friend Kevin, and sure enough the Mininote recognized the image on the disk and i was off to the races. When you install W7, you get a choice to do an upgrade if you’re running Vista, but if you’re running XP they pretty much do a clean install. I say pretty much because they do offer to set your applications and such aside in a separate folder called Windows.old. Since I have XP on the Mininote I took that option. the install went very quickly, I’d say less than an hour. I’m not going to do an exhaustive review of W7 for several reasons, mostly that I don’t think I found anything unique to add to al the reviews I found on line. I can verify that it feels faster than Vista – and that’s on the mini-note! I’ve tried to install a few odd applications that didn’t go well, I got messages on two Lotus products that said I had to be on a higher version of Windows oddly enough. Firefox installed without a hitch though and so did Adobe’s Air and Twhirl, my favored Twitter client. I’ve had trouble keeping a mouse recognized – tried three of them wired and wireless and they seem to come and go. An oddity is that the network connection bars for the wireless ALWAYS show no bars, even when i’m connected to a good network. Connecting to a network is WAY nicer on W7 than it is on Vista btw, you actually see the networks when you click on the icon in the task bar. With these issues I’m seeing, I’m surprised that Leo LaPorte and Paul Thurrott have been saying that W7 is ready, and that Paul is using it full time. I certainly wouldn’t put it on that kind of footing, unless they’re saying ready in terms of the way Vista was ready! Something I really like is the way i can “pin” apps to the taskbar, meaning the apps STAY where you put them. That’s always frustrated me on Vista. There are some sweet keystrokes to manage windows. Remember Fiwi from last week, that let us pop up two finder windows side by side so it was easy to drag files between two files? Windows 7 has that built in. Two ways to do it – you can drag a window all the way to the right side of the screen and it will turn the right side blue. Let go and the window will pop to taking up half the screen vertically. Do the same on the left and you’ve got what Fiwi gives us. The second way is not as snazzy looking but way easier – if you hold down the windows key and the right arrow, the front window pops to the right half of the screen. windows-left does the left, windows-up arrow gives a full screen of the front window. Keep going and you find windows space bar and you can see the desktop (but it jumps back to full of windows when you let go). My personal favorite though is windows-home key – that takes every single darn window you’ve got open and minimizes it and leaves you with just your front window. I LOVE that! I’m so lame about closing apps – I keep about 326 things open at all times, so this is really handy. I can tell you that Windows 7 is an improvement over Vista because after about 30 minutes of using Windows 7 I was missing those features in Vista. But guess what? LifeHacker posted a hack that lets you get those cool keystrokes in Windows XP or Vista! how cool is that! i tested this hack on Vista and they work exactly like I’d hoped. I just have to learn how to make things run at startup in Windows and it will be perfect. I was having a lot of fun playing with W7 on the HP Mininote, but to be honest I can’t see much on that high res 9″ screen at my age. I thought it might be even MORE fun to put Windows 7 on my MacBook Pro! I don’t own any virtualization software for personal use, so I decided to check out the free VirtualBox software from Sun Microsystems that they made open source. 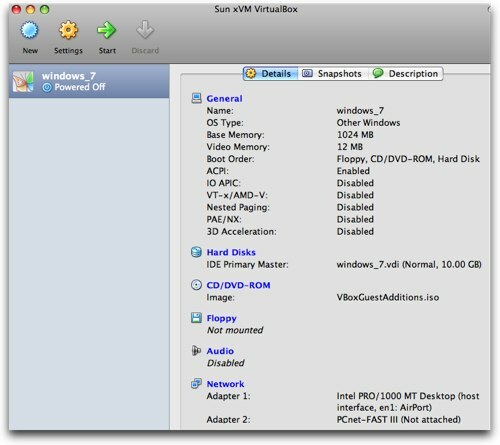 you can download VirtualBox from virtualbox.org. The coolest part about VirtualBox (besides the fact that it’s free and Open Source) is that it runs on Linux, Windows, Mac OSX and Solaris. You can’t beat that! I downloaded the installer and in no time I had it up and running. Since I had the W7 ISO on a DVD, I was able to slap that in my drive, click on New and follow the instructions to set up a new virtual machine. Of course I failed the first 3 times I installed it because I didn’t read very closely while I was doing it – the installer kept failing because while I thought I was putting in 10GB as the size of the virtual machine, I was putting in 10MB instead! Once I got past that hurdle it was clean sailing. I pointed the installer to the DVD drive and in less than an hour I had Windows 7 running on my Mac. I am still having some network problems with it though. You have to tell VirtualBox what network card to use for wireless the virtual machine – and the 4 choices are all ones I’ve never heard of. I did some trial and error flipping through each one and starting up W7, and finally I got one that would actually show up to Windows. Unfortunately it seems to attach and disconnect from the network, and worse yet it caused instability of the network connection from the Airport on the OSX side too. I have to quit VirtualBox AND log out of my user count on the Mac side to get it to stop being flaky. I need to just spend some quality time with it and figure out a better configuration. I just did an upgrade to VirtualBox so maybe that will fix it. when I get it working I’ll be sure to post the configuration that finally works! Donald explains the tool Winclone from twocanoes.com/winclone to clone your XP/Vista bootcamp partitions. I always love your reviews Donald, you explain what’s cool, explain how things could be cooler, and you give us practical uses – keep them coming! Check out galacticstrings.com to read her comment and get the links to download the software she recommends. Thanks Jane, that’s pretty clever! I wonder if I would remember to run this the next time I have to write down a path? It’s so tedious to write them down but with all the answers I give I’m doing it all the time for people! telling them where that darn plist file is and just hoping I spell it right! Thanks for a great little tip! So Wednesday night was the season premiere of Lost. Lots of anticipation on this one – cleared my calendar, Steve has it all set up – we’re actually all ready in front of the TV, and at EXACTLY 8pm when the show starts, our cable goes out. Seriously!?! I mean it – no TV no cable no internet! Our only saving grace was the EVDO card in the Cradlepoint so we could still get on line. There were bad words said in my house that night. One of Kyle’s friends remarked how sad it was that all three of us had set our Facebook status to how mad we were that we were missing Lost! Steve and I tweeted it too of course. One twitter response made up for all of it though. Paul, aka isherbet famous from last week’s show tweeted about an application called Ted from ted.nu as a solution to my Lost woes. He didn’t give me any more hints, other than telling me ted was ripe for a review, and you know how succeptable I am to suggestion! I had no idea what ted was but I jumped right in. It turns out that ted is an open source application that runs on Windows and Mac and it finds episodes of TV shows online through Bittorrent. now we’ve spoken about Bittorrent quite a bit before, and I don’t condone stealing content at all. But I’m paying over a hundred dollars a month for cable TV and I was denied Lost, so I walked into this guilt free! When you first open ted it asks you to set up a few things, like your time zone and where to download the torrent files, things like that. Next up you have a window that has an option of add show. The window has a big blank area on the left, a blank area on the right, and a blank field that says Select a show. Down at the bottom it says Add a custom show. That’s the only button I had to push, so I pushed it and typed in lost and things went horribly wrong. Ok, maybe not horribly, but I didn’t find Lost, I found some mutant show with Lost in the middle of the title. I canceled out of all those windows and when I got back to the original window, it had populated with a lovely list of normal TV shows! It turns out that big blank area takes a few seconds to populate with your local shows, so just give it a second before you go pushing buttons! You can use the field at the top to search for a show, or scroll till you see something you like. 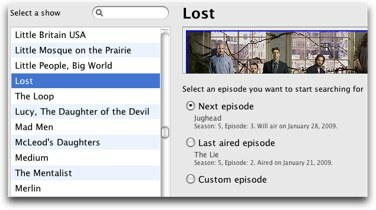 Once I chose Lost, I got an interesting graphic from the show, and a choice of Next episode, Last aired episode, or custom episode. I delightedly clicked on Last Aired Episode which showed it was Season 5, Episode 2, aired on January 21st. in just a few seconds it found the show, opened Tomato torrent (my current Bittorrent application and began downloading (and uploading Lost for me. Note that you do have to have a Bittorrent application already resident on your machine, ted doesn’t have one of it’s own and won’t download one for you. The website for ted had a few advantages listed, and one of them was that you could watch in your own language. I wasn’t sure how to test that other than to change my timezone but I thought it might be of interest to some of you to check that out. Of course there IS documentation for ted, but I didn’t mess around with that. go check it out yourself at ted.nu! Hi. This is alex, you know, from inside your mac. I want to tell you about caring for your gadgets. You love your mac, and you want to take care of it. So the best place to keep it running at its best is the Apple Store. Likewise, you want to keep your car in tip top shape. You should own a Honda or an Acura, and Live in the LA or Orange County area, and if you don’t, you might as well be running Windows. But if you do, you should call Honda Bob! He is to your car, as the Genius Bar is to your Mac. He keeps your car in perfect running condition, and in the unlikely event something does go wrong, he will fix it for you with minimal hassle. So what are you waiting for? Go poke around on his Web site at hdabob.com. Then, Fire up your iPhone and give Honda Bob a call, at 562-531-2321. Or, open up Mail dot app and shoot him an email at hdabob@aol.com. H D A bob’s mobile service is not affiliated with Honda, Acura, or Honda Worldwide. Easy to know what not to do – don’t steal software! For normal people who just need a backup drive, Drobo is uneccesary. how much would a terabyte cost in a Drobo? So for $110 we get a perfectly good backup drive of 1TB, or we can spend $550 to get a redundant, high availability storage solution. What do normal people need? The drobo is not about cheap storage now. It’s about scaleable and safe storage for the future. I have no data that I am happy to have on a single disk. Disks die. Period. If it’s important enough to store, I need it stored safely. Data grows. My first computer had 40MB of disk space – and I thought I’d never fill it! That’s about 5 photos now! Now you need a TB, a year from now you’ll need more. Then what? I currently buy disks in pairs. I have two mirrors 250GB disks, two mirrored 500G disks, and now I need another disk, i.e. another two. Two 1TB disks? My desk is a mess! Disks everywhere, no more power outlets to plug stuff in to! Drobo is a box I can keep for a long time. As I need more space, I add another drive, what ever I can afford. When it;s full, I start swapping the smallest drive out for a bigger one each time. No data migration, no sprawl of disks on my desk, and no need for two disks instead of 1! As a followup to your problems with networks and Windows 7 in VirtualBox, did you install the Guest Additions? When you’re running the virtual machine, go to Devices in the menu bar and click Install Guest Additions, this will install some extra stuff that will let you use Audio and USB (and maybe fix the network stuff) with Windows 7 under VirtualBox. Oh, and Al, burning ISOs is now supported in Windows 7. Just started listening to this weeks show, and wanted to post this before I forgot. I downloaded the windows 7 beta on my Mac in Firefox, no IE needed. It did require me to log into my silly Windows Live account, which I did have already. I installed in VMware Fusion, and I didn’t even need to make a DVD of the ISO file. It allowed me to use the ISO file directly. BUT, I did make a DVD for backup in Disk Utility. Worked great! No Windows or IE needed! Listening to the rest of the show now. ha, aren’t you glad I am listening at work, where I have access to a computer and can post a comment right away! haha! I want to let you know that you can indeed be in High School (or even K-12) to get Educational discounts on software. academicsuperstore.com is one of the best places. I used to teach online, and I was lucky enough to get discounts on a bunch of wonderful software. Before Macromedia was bought by Adobe, I got all their software. I loved that! anyway, I digress…but yes, you can get discounts if you are a K-12 student, teacher, and I think even home-schooled student. As for finding the startup folder, easiest way is to type “shell:startup” in the run menu and it will be displayed in a explorer window. Very hand since Microsoft keeps moving around the damn thing from OS to OS. One good feature of Windows 7 is that that you can now burn a iso directly when you right click on one. Yet you still can’t mount an iso file directly. This is crazy since everything on MSDN is an iso file and you have to use a 3rd party utility to mount it. OSX handles everything so much easier. As for the drobo argument. It depends on how important your data is to you. The drobo is like an insurance policy, yeah you pay extra for safety – but when you need it you are really happy. If a backup drive goes down, then you have no backup until you get a new drive and then backup your data. If anything happens to your main drive during that time, then you are out of luck. If you used a backup drive as a time machine drive and it goes down, you just lost your history. Does the average person need a drobo, depends on how important their data is for them. For worry free backup, it is pretty much the best solution. Now I don’t have a drobo, though I certainly would like to get one in the future and it is certainly true that the price is a deterrent. Right now I have 4 drives in my Mac Pro where I use 3 for backup. Plus another external drive to backup my Macbook Pro. The drobo also lets you add storage without have to throw away previous investment. Yeah you can buy a new backup drive when they get cheaper to replace current, but it is better to be able to add instead of replace capacity. As for the question of how much capacity you need. Well it is a good idea beside using time machine to clone your drive and create an image. I do this weekly and try to keep previous images until the drive is filled and I have to delete old backup images. Plus the drobo has apps now and you can even access content over the web. A comment on ISO Burning. I’m platform neutral and have used ImgBurn for some time now and love it. Whenever I fix a PC I install it. As mentioned by debbie T Disk Utility does burn from ISO images. But if you really want to rock with the cool kids on a Mac, you’ve got to open up Terminal and do it from the command line. The command “hdiutil” has more options then you can image but burning with it couldn’t be easier. In this example I burned the disk image Pinnochio.iso to a CD. For simplicity, I moved the image file to my home folder. The user types in the bit after the $, all the rest is progress reported by the system. 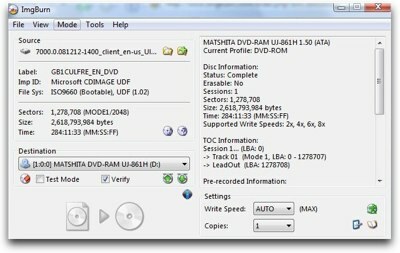 Verify and eject are default functions so the completed disk just pops out when completed. The command also works with .dmg files. To see all of the options of hdiutil go back to terminal and type “man hdiutil”. A developer named James W. Walker has a collection of free scripts called “Custom Hybrid CD Kit” which helps you create Hybrid (cross platform) disks on a Mac. The output is an ISO image file. The scripts allow you to designate which files are hidden in Windows Explorer or the Mac Finder. Anybody who has tried to create one of these will appreciate this little bundle.